You have probably already read this expression or its variants if you are a reader of the Bondamanjak site. In fact, historically speaking, we do not confuse anything at all; we perpetuate the use of a popular designation in the seventeenth century: the pistachio tree [la pistache de terre]! Today, therefore, I will speak to you chroniclers, travelers and arachis hypogaea in our French Caribbean islands. Originally from Latin America, the pistache de terre was one of the many names used to designate what is more commonly called today in France the peanut [cacahuète]. Cultivated well before the arrival of Europeans in the Americas, seeds were found in tombs of the Inca Empire in Peru. The word peanut [cacahuète] comes from the Spanish cacahuete, which itself comes from the Aztec tlacacahualt, literally « cocoa of earth ». Then why are we talking to the pistachio [pistache] in French West Indies? In a descriptive note in the margin of the description, Labat indicates that he refers to « pistachio of the isles otherwise Manobi ». Nevertheless, this name of Manobi never seems to have been commonly used, even if it is known and mentioned by Louis de Jaucourt in the Encyclopedia in the article « pistachio » in 1765 and also in another version of the Encyclopedia in the article « pistachio de terre » in 1774; one can indeed read « Seing manobi sive mondubi. This plant, which may be the ynchi of Peruvians, the mani of the Spaniards, & the araquidna of botanists, grows in Brazil ». In short, Labat is rightly of the opinion that the term pistachio [pistache] is misused, but it is well under this name that peanuts [cacahuète] were known to the French in the 18th century. When we look at the dictionaries, the CNRTL attests to the existence of the words arachide and cacahuète as early as 1801. The fact remains that in use, peanut [cacahuète] appears to be absent. In 1808, Sonnini published a treaty on peanuts or pistachio nuts [traité de l’arachide ou pistache de terre], not a treaty on peanuts. The definitions of the Littré dictionary of 1880, confirmed this tendency in the choice of words; one realizes that the groundnut [arachide] is imposed as the adequate word while the pistachio [ pistache de terre] is presented as the vulgar name; more surprisingly the peanut then entered « cacahuet » still seems only a little known synonym. It is obviously necessary to wait until the 20th century for the word peanut [cacahuète ] to impose itself in the French vocabulary at the expense of the pistachio [pistache de terre]. Ground peas, groundnuts, peanut seeds, peanuts, pistachios… [Pois de terre, graine d’arachide, cacahuète, pinotte, pistache, pistache de terre...] When we see the persistence of the use of the word pistachio [pistache] among French authors who had been on the islands at least until the middle of the 19th century, it is not so surprising that the French-speaking Antilleans regularly still refer to this small fruit as pistachio [pistache]. The use of the word can sometimes be confusing, but if you prefer the use of the word pistachio or peanut, I invite you above all to the pleasure of tasting a pistachio cone or nougat Péyi. How about you, you say pistachio or peanut? Feel free to leave the answer (with a region) as a comment. Note (1) Garcilaso de La Vega, the son of an Inca princess and a Spanish hidalgo, refers to peanut in 1609 as « Ynchic » (Quechua language) and explains that if eaten raw, it hurts the head. This information is also found in the Spanish Jesuit missionary Bernabe de Cobo. 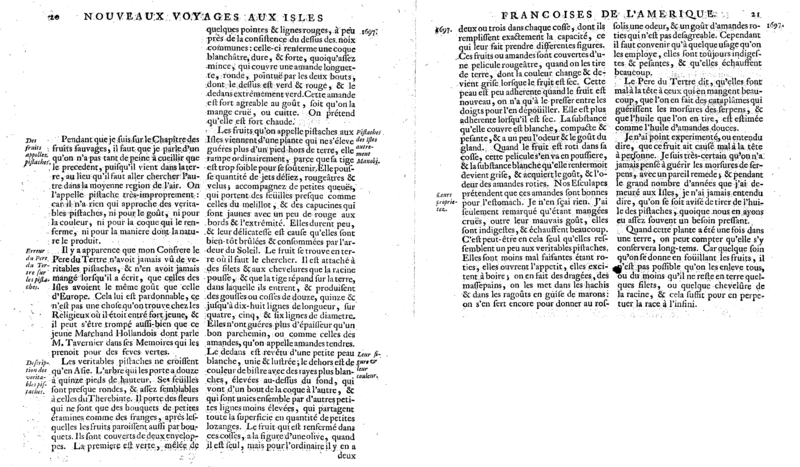 Dutertre may have read one of these texts and copied the information disputed by Labat.